Why don’t they float to the top? I came across an interesting publication with data from a Zetasizer that I thought would be good to share here. If you want to read the whole story, you can find it in Environmental Engineering Science 35,11(2018), pp. 1216-1227 by L.N. Meedoga, W.A. Hewage, and J.H. Batagoda under the title “Stability of Nanobubbles”. The authors report a hydrodynamic size range from ~50nm to ~700nm. 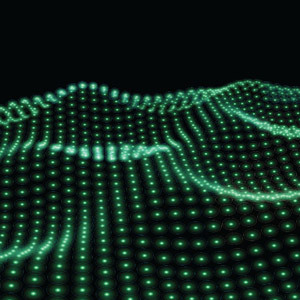 While this may in the strictest sense fall slightly outside the definition for Nanomaterials, the term Nanobubble has existed for several decades. The authors did some clever experiments showing that different gas molecules – as well as pH – can lead to different hydrodynamic sizes. 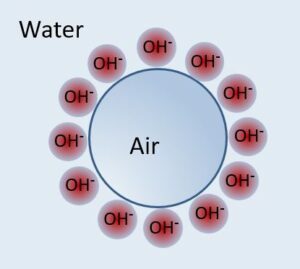 Ozone, Oxygen, Air, Nitrogen can all produce good nanobubbles, with size ranges from 50nm-200nm, [2mM NaCl, pH7, 20°C, 0.3mS/cm]. pH influences Oxygen nanobubble generation. At pH10 (~80nm) the size is much smaller than at pH4 (~350nm). pH influences Oxygen nanobubbles stability. At pH10 and pH7 the size grows slowly to only about 200 to 300nm, respectively, over one week. The authors also include data showing an interesting size increase of ozone nanobubbles in up-to 1 molar high salt, 1M NaCl. Ozone, Oxygen, Air, Nitrogen nanobubbles exhibit zeta from ~-25mV to -20mV, so were always negative at standard conditions [2mM NaCl, pH7, 20°C, 0.3mS/cm]. Oxygen nanobubbles generated at pH10 (~-27mV) were much more strongly charged than those generated at pH4 (~-4mV). Oxygen nanobubbles lost effective charge over one week of observation, about 5mV per week, making low pH starting conditions neutrally charged. They also show the typical decrease in zeta potential magnitude when salt is added. (This is due to Debye screening). What all this indicates is that charge stabilization plays an important role in the stabilization of nanobubbles. Select nanobubbles data from Meedoga et al. (primarily oxygen, excluded ozone) are summarized in this scatter plot titled “Nanobubble size versus zeta potential”. 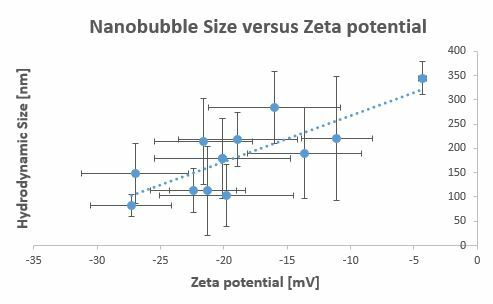 Stronger, more negative zeta potential is generally consistent with smaller nanobubble hydrodynamic size. NB: In addition to above, the latest Zetasizer Ultra can also determine the concentration of nanobubbles, typically in the range from E7 to E9. 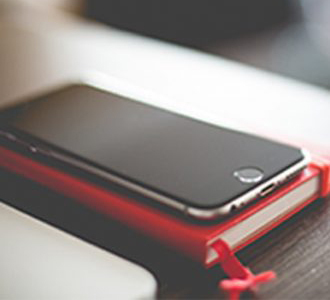 This extends the range of nanoparticle tracking analysis, for details see application note on Nanobubble Characterization and white paper on Nanobubble NTA.